A great many regular RV travelers prefer to bring their dogs out on the road to leaving them at home to be cared for by others. Road tripping is a lifestyle that is well suited for dogs since they get to enjoy fresh air and outdoor activities just like their owners do. Fortunately there are many parks across the country that not only allow dogs but even encourage and pamper them. 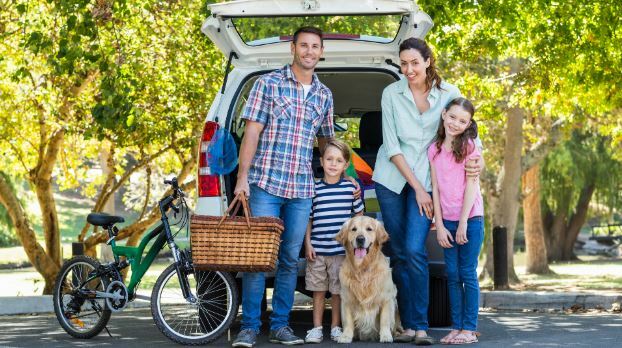 RV rentals can be chosen specifically to make sure your dog or dogs are comfortable on the trip, and if you book one of these dog friendly parks for your stay you can rest assured that your pet will have just as pleasurable an experience as you will. If you happen to be taking a longer trip you can even book two or three different dog friendly RV parks along the way. Whatever the case may be for your trip, check out these top dog friendly hotels and consider them if you are traveling in these regions. Located right in the heart of hiking and climbing country, not to mention some of the most gorgeous scenery in the nation, this well-equipped and maintained park is fully dog friendly. There is even a dog park here so your dog can run off some steam and get to play with the other visiting dogs. Plus with all the nearby hiking trails you can take advantage of, your dog will have plenty to do. All of the trials are dog friendly so you can bring your traveling companion out on your hikes. Not only is this one of the top parks in the country, it’s also one of the dog friendliest. Travelers have been discovering Evergreen Park for many years and this has rapidly becoming one of the most sought after camps in the Midwest due to its stunning scenery and access to the Amish country. He park is totally dog friendly as well and comes equipped with a grooming station and dozens of dog-friendly trails. Located right in the heart of iconic Big Sur on the California coast, this is a stunningly beautiful park offers water views and a plethora of activities. The park allows for two dogs on your stay. Plus there is lots of outdoor space and many activities that your pets will love here, including hiking and miles of stunning coastline. Any dog owner on a California coastal RV rental run should definitely consider a stay at Riverside. Down in sunny central Florida you will find this great park known for its manicured grounds, relaxing atmosphere, and pet friendliness. Your dog will love it too since this park is fully pet friendly. This is a leash free zone, so your dog can run free with the others in the camp. Plus there is an obstacle course and lots of open outdoor space for any pet to enjoy. With great year-round weather and plenty to do, both owners and their dogs will have a great time at this park. If you’re traveling with a dog in southern California, then you will definitely want to check out Escondido. This is also a leash free park where dogs can mingle and run around free, but it is fenced in so there are no worries in regards to safety. There is a large dog park here plus a dog fountain so they can cool off on hot days. Plus don’t forget about the many beaches in the region that can be enjoyed by owner and dog alike. When it comes to dog friendly RV Parks, Normandy Farms really takes the cake. Not only is there a 2 acre dog park where dogs can run free and mingle but there’s also an obstacle course, drinking fountains, and a dog bathing area. Plus, if you wanted to head out on an activity that is not dog friendly, there is a kennel at the park that will look after you’re dog while you’re gone. This really is the top of the line in dog friendly parks, so consider it if you’re on a New England run. There are a great many RV parks across the country that not only welcome dogs but even pamper to their every need. Never be afraid to take your pet out on the road since dogs are perfect for RV travel, plus they are great companions and work to enhance the trip. No matter which area of the country you may be traveling in there is sure to be a dog friendly park in the region. Take after the thousands of RV rentals travelers who travel with their dogs each year.